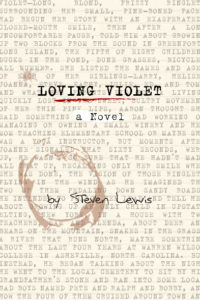 September, 2017—New Paltz, N.Y. LOVING VIOLET is a cinematic narrative about conflicting dimensions of love, romantic as well as familial, told against a backdrop of the pleasures and frustrations of “the writing life.” A generational sequel to TAKE THIS (Codhill Press, 2015), the book follows the late Robert Tevis’s grandson Aaron through his entry into a graduate MFA writing program and the arms of the most drop jaw gorgeous—and disarmingly untethered—girl he has ever known. Steven Lewis is a former Mentor at SUNY-Empire State College, and current member of the Sarah Lawrence College Writing Institute faculty. His work has been published widely, from the New York Times notable to the Road Apple Review obscure, and includes a biblically long list of parenting publications (7 kids, 16 grandkids). He is a Contributing Writer at Talking Writing, Literary Ombudsman for 650: Where Writers Read, and El Jefe of the Duckdog Writing Retreats on Hatteras Island, N.C. Among his many books are ZEN AND THE ART OF FATHERHOOD, FEAR AND LOATHING OF BOCA RATON, TAKE THIS (Codhill Press), IF I DIE BEFORE I WAKE (Finishing Line Press), a chapbook of poems.